Calafia Beach Pundit: The Fed is not "printing money"
Confidence: half full or half empty? Why is everyone so gloomy? The Fed is not "printing money"
The idea that the Fed is "printing money" with abandon, and that this is seriously debasing the U.S. dollar, is a fiction borne of ignorance of how monetary policy actually works. Fed policy may indeed pose the risk of serious debasement in the future, but to date there is little or no evidence to suggest that this has occurred. The above chart is a graphical depiction of how the Fed's balance sheet (in simplified form) has changed over the past six years, from a time in early 2007 when the economy was growing normally (although the housing correction was just beginning), to the situation today. 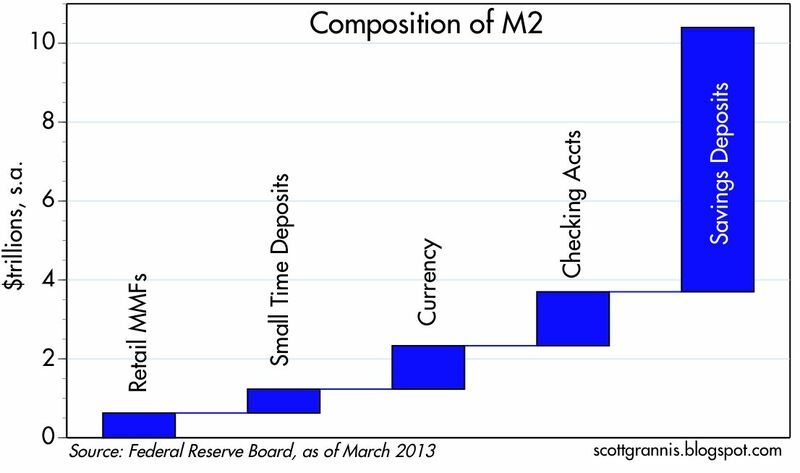 The major changes: on the liability side, relatively normal growth of currency in circulation (see below for details), and gigantic growth in bank reserves; on the asset side, the elimination of T-bills, strong growth in T-bonds, and unprecedented growth and holdings of MBS and Agency securities. Put another way, the Fed has purchased about $2.36 trillion of T-bonds, MBS, and Agency securities, shed about $280 billion of T-bills, and in the process created $420 billion of new currency and $1.7 trillion of new bank reserves. 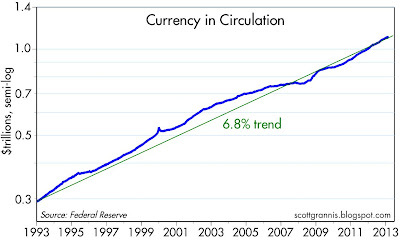 As the chart above shows, currency has grown at a 6.8% annualized rate since early 2007, the same rate that we have seen for the past 20 years. Currency actually grew at a faster rate from 1993 through 2003 than it has in the past six years, and the former was a period when inflation averaged 2.5%. In the past six years, inflation has averaged about 2.2%. So the recent growth in currency is nothing out of the ordinary, and does not necessarily imply higher inflation than what we have seen in recent decades. 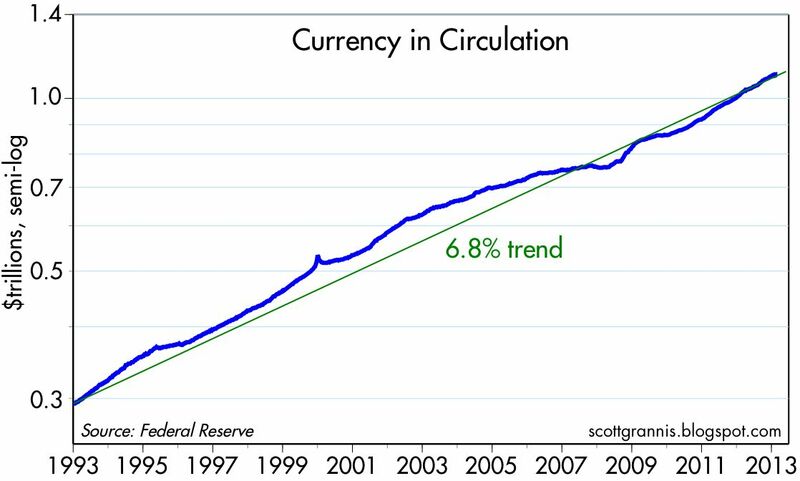 It is also important to note that the Fed only supplies currency on demand, in exchange for bank reserves. Thus, the Fed cannot "force-feed" currency to the world. The world holds only as much currency as it wants to hold, so growth in currency is not necessarily inflationary at all. 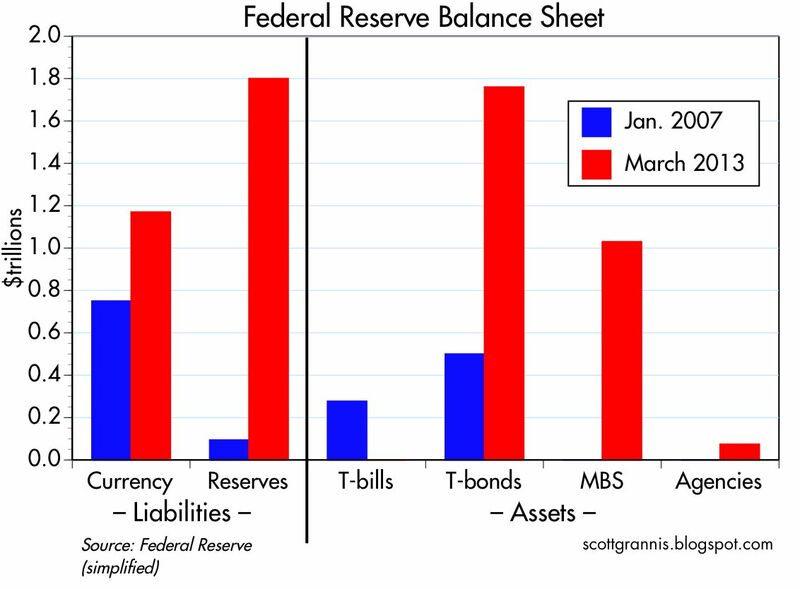 In addition to currency in circulation, the other major component of the Federal Reserve's liabilities is bank reserves, shown in the chart above. Here we see enormous growth, orders of magnitude in excess of historical experience. In fact, the Fed has expanded bank reserves by a factor of 18 in the past six years. Isn't this the same as "printing money?" No, because bank reserves aren't "money" and can't be spent anywhere. Bank reserves exist only as a liability on the Fed's balance sheet. Banks can exchange their reserves for currency, and currency can be spent, but as we saw above, currency has not grown by any unusual amount. Banks have instead been content to hold on to the majority of the reserves the Fed has created. This is due to the fact that the Fed started paying interest on reserves in 2008, which makes reserves functionally equivalent to T-bills, and the fact that banks have wanted to increase their capital and fortify their balance sheets, and bank reserves fit that bill. In effect, the Fed has been doing nothing more than swapping newly-created bank reserves for bonds and currency, and the world and the banking system have been happy to participate in the swap. The Fed has taken duration risk out of the market and supplied low-risk and highly liquid assets in return. In a post last December, I described how in a way the Fed has been acting like the world's biggest hedge fund. Banks can exchange their reserves for currency if the public demands it, or banks can hold on to their reserves if they want to increase their capital and fortify their balance sheets. The only other thing banks can do with their reserves is to support an increase in their deposits. In our fractional reserve banking system, banks must hold about one dollar of reserves for each ten dollars of deposits. Banks are the only ones who can "print money," and that is done by extending credit to borrowers. Given the increase in bank reserves, banks could theoretically have increased their lending and their deposits (which currently total about $8.7 trillion) by a factor of 18, or over $150 trillion. Obviously, nothing of the sort has happened. 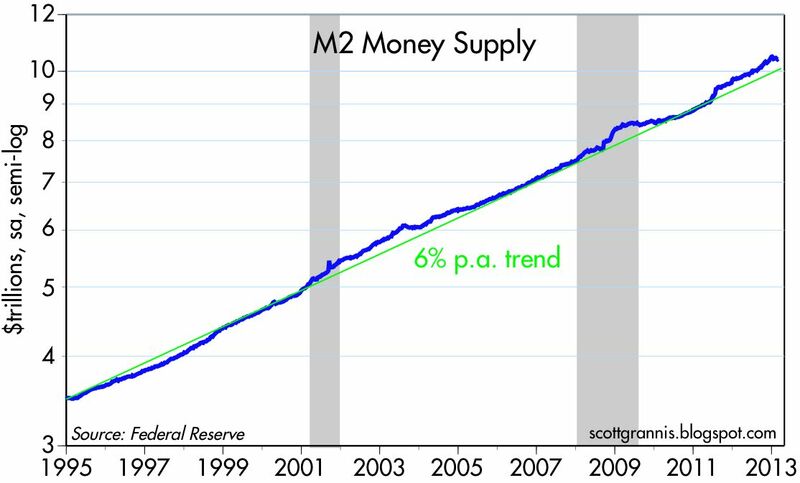 As the chart above shows, the M2 measure of the money supply has grown only slightly more than 6% per year for the past 18 years. Since early 2007, M2 has grown at an annualized rate of 6.5%, about the same as currency. Again, there is no sign here of any usually fast growth as a result of the Fed's enormous expansion of bank reserves. The proof is in the pudding: inflation by any measure has been averaging between 2 and 2.5% for the past six years, with no signs of any acceleration. We are thus forced to the conclusion that the Fed has not allowed any undue expansion of the money supply. Whatever growth in the amount of money there has been has only been slightly in excess of the world's increased demand for money and money equivalents, and that is why inflation has been relatively low. As the chart above shows, the world's demand for M2 money has been extraordinarily strong in recent years. Since early 2007, M2 has grown 26% more than nominal GDP, with the result that the ratio of M2 to nominal GDP has reached its highest level since the late 1950s. 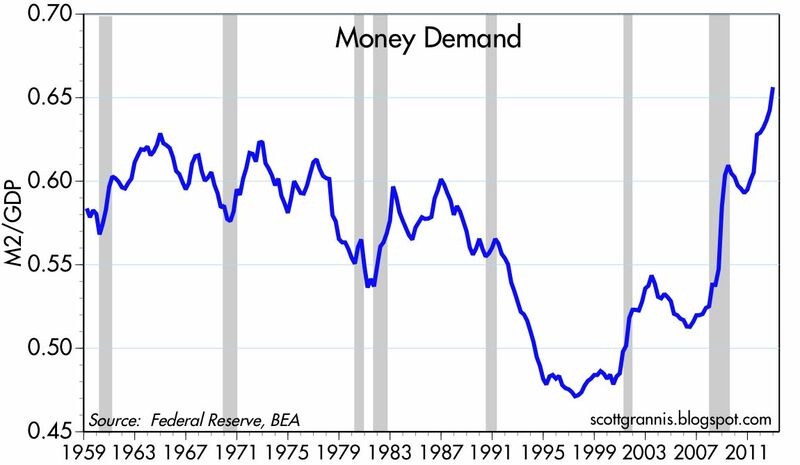 Monetary policy has been enormously accommodative, but at the same time money demand has been exceptionally strong. It follows that if the Fed hadn't been so accommodative, we could have suffered deflation and/or a weak economy, since the economy would have been starved for liquidity. Since November 2008, the fastest-growing component of the U.S. money supply has been savings deposits, which have increased 68%, from $4 trillion to $6.7 trillion. 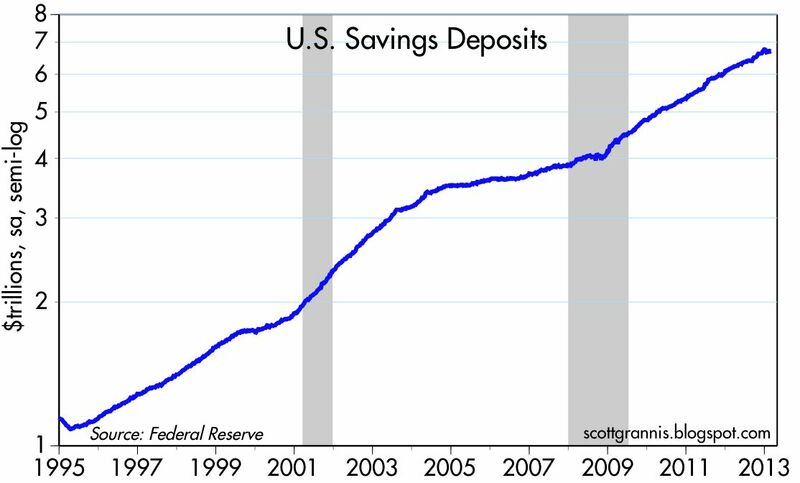 The enormous growth in savings deposits has almost certainly not been driven by their attractive yields (which have been close to zero), so it must be due to an overwhelming desire for liquidity and safety. Consumers have been deleveraging and increasing their money balances to an exceptional degree because they have become more risk-averse. 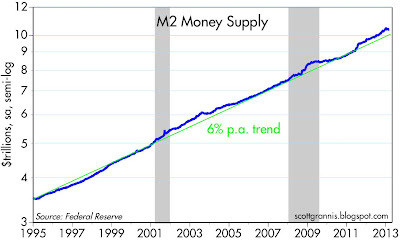 Most of the growth in the money supply has been due to an increased demand for money and safety. And just as consumers have worked hard to increase their money balances, banks have been very willing to hold on to the extra bank reserves the Fed has created, as they have struggled to boost their reserves and fortify their balance sheets. 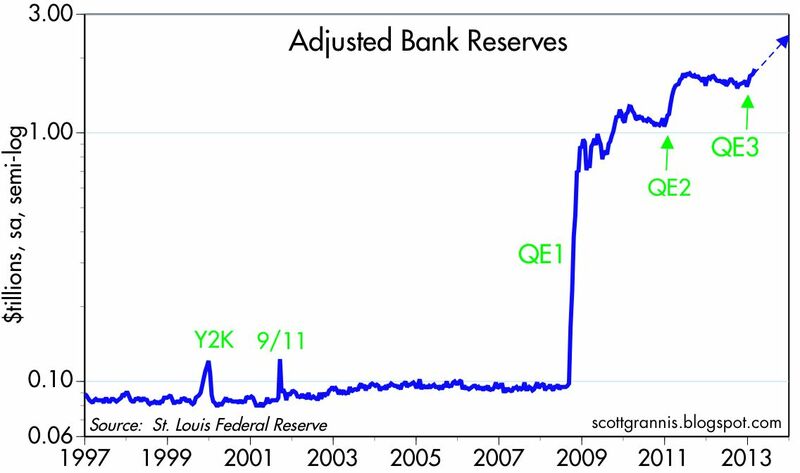 In a sense, the Fed has spent most of the past 5-6 years responding to an unprecedented increase in risk aversion, which has manifested itself in a tremendous increase in the demand for cash, cash equivalents, deposits, and bank reserves. This increased demand for safety and liquidity has been the flip side of an equally unprecedented decline in confidence and an increase in risk aversion. ... the biggest risk we all face as a result of the Fed's unprecedented experiment in quantitative easing is the return of confidence and the decline of risk aversion. If there comes a time when banks no longer want to hold trillions of dollars worth of excess bank reserves for whatever reason (e.g., the interest rate the Fed is paying is no longer attractive, or the banks feel comfortable using their reserves to ramp up lending, or the public no longer wants to keep many of trillions of dollars in bank savings deposits), that is when things will get "interesting." Stephen Williamson discusses this same issue in great detail here, but from a slightly different perspective. The common thread we share is that the thing to worry about going forward is a declining demand for cash, cash equivalents, and bank reserves, since that could result in higher inflation if the Fed fails to take offsetting measures (e.g., draining reserves and/or increasing the interest it pays on reserves) in a timely and potentially aggressive fashion. There is no a priori reason to think they can't, but there is certainly reason to be worried, since we are sailing in uncharted monetary waters. Unfortunately, it's ironic and paradoxical that the Fed's efforts to supply additional reserves to the banking system—at a time when the banks have many times more reserves than they could possibly want—may be doing just the opposite of what the Fed intends. Instead of boosting confidence, the Fed may be contributing to worries about the future course of inflation and interest rates. More reserves are not going to increase bank lending, since banks already face zero constraint on that score. Will more reserves increase confidence, or will they just increase concerns about the future? It's not clear at this point what will happen as the Fed increases its purchases of Treasuries and MBS and creates more bank reserves in the process. But as long as uncertainty exists—and the Cyprus bank deposit fiasco threatens to increase risk aversion in the Eurozone—the demand for reserves is likely to remain strong and inflation is likely to remain subdued. As for the economy, it looks like it is slowly healing and taking care of itself. well i finally had to go to the trouble of signing in to respond to this post. if the consumer was in one great big "deleveraging" as Even You Admit, then when the money supply continues to go up, what does that tell you about what the gov't and fed have been doing? does it tell you anything, calafia? it surely tells me something and i think it should've told you something, too. c'mon! if it weren't for the fed, money supply would have DROPPED precipitously. I think when the Fed engages in sustained QE, it is paying cash (digitized, but nevertheless) for those assets it buys. The asset sellers can then spend the money, or re-invest it (both good). This tends to raise real output, and asset prices, both good. I sense the Fed should buy only US Treasuries, so it is not politicized. The buying of MBS could get fishy very quickly. Add on: There is no law the Fed ever has to sell the Treasuries it has purchased. It can hold to maturity, essentially wiping out federal debt. Given where we are, this is a terrific option. The QE seems to be working. John Taylor gushed about a Japanese QE program the BoJ ran from 2001-5. 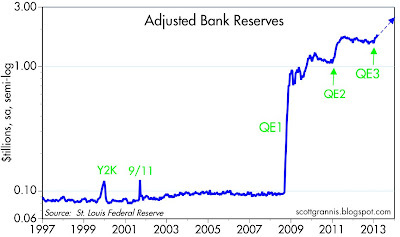 So there is a track record of QE working. Oddly enough, QE in Japan did not lead to inflation, nor does it seem to be here in the USA. The Fed seems to be able to buy federal debt without causing inflation. 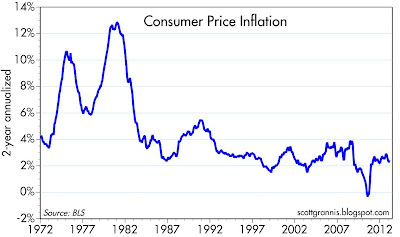 Recent rates of inflation have actually been subpar, even below that which we might want. Gold cracked a couple tears back. Commodities indices are below year ago levels. These are the most interesting times in the monetary policy world ever. I sense the Market Monetarists are right---it is time for aggressive, confident expansionism, on the part of the Fed. (And the ECB and the BoJ). The demon is no longer inflation. 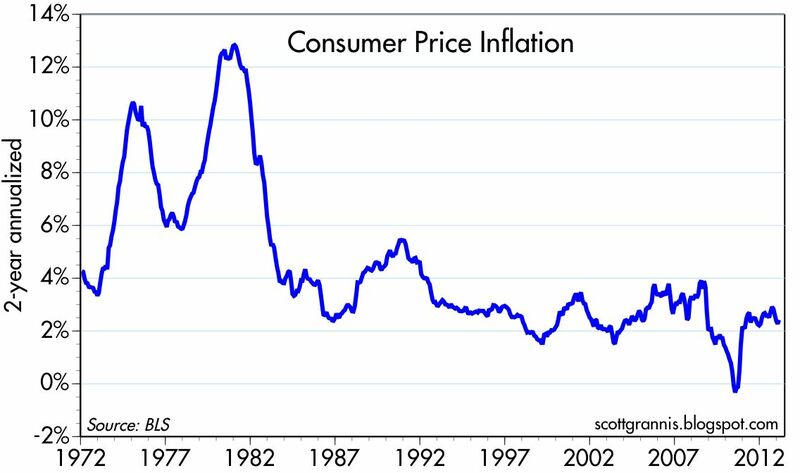 A 30-year war was waged on inflation, and it was won. Check out sovereign debt yields for the last 30 years.Everyone is cramping zero bound. In Japan, they were never able to get out of zero lower bound. Can the Fed avoid the same deflationary quicksand? I enjoy reading your blog and for the most part find it very instructive. But your figure of 2.5 percent inflation over the long run does not agree with the reality of my experience over the last few decades. Prices in the 1980's were clearly significantly less than half of what they are today no matter what magic comes out of the government's figures. I've got a question, and I truly want to understand the process of all this "reserve creation." I am one of those people that believe the Fed is indirectly printing money. You say: "In effect, the Fed has been doing nothing more than swapping newly-created bank reserves for bonds and currency, and the world and the banking system have been happy to participate in the swap..."
So, what exactly are these "newly-created bank reserves," if the Fed is exchanging them for real-world, dollar-dominated assets? I understand reserves are "stalled" in the banking system, for now, but how can the Fed get "rid" of reserves? They've already created them and dished them out? And, they exchanged them for real-world assets. If I go out on a shopping spree and I pay for everything with IOU's, how would this not be problematic? Especially if I had control of a printing press? And think about the other side, if my IOUs are simply sold off to the Fed and never seen again. Who knows what the characteristics or investment process is for the Fed. In effect, is the Fed not doing the same? Are reserves not IOU's? Is the Fed not "issuing a security," which is no different than Congress issuing debt, which the Fed is now gobbling up? And the Fed can't remove reserves, can they? If so, how? Would it not be "taking" assets from banks, almost what happened in Cyprus? I understand that they could, in affect, screw the banks by raising required reserve ratios, but this has yet to be seen. Also, it seems they are extending their reach to impossible limits, way beyond anything than just helping to keep the banking and monetary supply stable. Because of all of this, I believe someone, some country, will return to the gold standard, especially if we do "return to growth" and people demand stability in fiat currencies. It begs the question of who will do this? I can't help but be concerned with China's reserves. Yes, they're communist and harbor political risks, but they could deter concerns with a gold standard and take a page right out of the US's history book, becoming the financial reserve currency of the world. People also seem to forget about the overwhelming investment in the country from everyone over the last few decades, and they could only 49% of their operations. No company saw issues with that. To be the reserve currency, you need a robust military. Don't think anyone is going to mess with that issue. They seem to check a lot of boxes of potential suitors to come out with this news. I don't think it will come out as an "end of the world" scenario like so many obnoxiously "prophecy." It will come as a more subtle transition. Just a thought. I would love to see a future post about how the Fed specifically "creates" these reserves? What banks hold these massive amounts of reserves? Just a more detailed analysis of how exactly the process works. Great post though! Love your work. Re: the creation of bank reserves. It is done by a simple accounting entry. Banks have accounts with the Federal Reserve in which they "own" bank reserves. If the Fed buys bonds, the bank that sells the bonds to the Fed gets credited in its account for the amount of the purchase. Not in dollars, but in "bank reserves." Bank reserves can be spent only by exchanging them (1 for 1) for currency, and then spending the currency. Banks must have about 1 dollar of bank reserves for every 10 dollars of deposits. That's it. Re: how much inflation we've had since the 1980s. In my long experience with the inflation statistics, I have often questioned whether they understate the actual rate of inflation. I have never been able to demonstrate to myself that they do. In fact, I am persuaded that the CPI actually overstates inflation by about 0.5% per year, the same conclusion reached by the famous Boskin Commission many years ago. I think the problem arises from an underappreciation by the public of just how much prices for some goods have fallen as a result of improving quality and capability. Tires last much longer and cost less. TVs last much longer and consume less electricity. Computers cost much less than they did in the 1980s but do millions of time more things. You can put together a feature length, high quality movie on personal computer for only a few thousand dollars, when it would have cost maybe a million in the 1980s. Computers today allow us to do so many more things that we couldn't do in the 1980s. Over at the mises. Timely. I think you've finally become complacent. This will end terribly and everyone with a decent sense of markets knows this. Question is when. The suppression of volatility (taking duration out of the market) deprives the market of vital information necessary for a healthy market. Once suppression runs its course, eventually the dam burst wide open as everyone runs for the exit and front runs the Fed. "Contrary to popular thinking, loose monetary policy, which leads to a misallocation of resources, weakens the economy’s ability to generate final goods and services, i.e., real wealth. This means that loose monetary policy not only cannot provide support to the economy, but on the contrary undermines the foundations for economic growth." I understand Austrian theory. If the Fed were indeed "too loose," as the Austrians believe they are, then I would agree that things would end badly. But I think my analysis of monetary policy shows that the Fed is not "too loose." More like "just about right." They may well become too loose in the future, something I worry about, but for now they are not. Evidence of "just right:" I note that gold prices are unchanged since mid-2011, non-oil commodity prices today are about where they were in the first half of 2008, the dollar is up about 15% from its 2008 lows, and TIPS breakeven rates are right around their historic norms. These market-based indicators of monetary policy show no sign at all of the Fed being "too loose." Interest rates are very low primarily because the market is still very fearful of another recession, and doesn't expect much in the way of growth in coming years. I would argue looking at prices since 2008 sort of misses the path. Recent CB activity is specifically designed to maintain the misallocations of 2001-2007. Complete subsidizations of markets. Therefore it seems more relevant to ask where would prices be if CBs didn’t bailout everyone and how long can they artificially prop up asset markets. We have plenty of Canaries flying around…. So it's not printing money? Tell that story to Santa. M2/GDP is going up because "demand for money" is so high? The banks, who are taking excess deposits to London-based internal hedge funds (JPM: 60% loan/deposit ratio, meaning 40% is for speculation) do not seem to see any "high demand" for that money. If your theories weren't so wrong I wouldn't even bother to post here. I think you are confusing "demand for money" with "demand for loans." The demand for money means the desire to hold cash, and cash equivalents. Holding cash and cash equivalents is being "long" of money: holding money, not borrowing it. Increased demand for loans, in contrast, is the opposite of the increased demand for money, since it is being "short" of money. 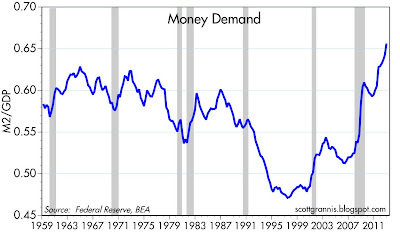 When money demand rises, the demand for borrowed money declines. Excellent work, Scott. I also agree that the big unknown here is what happens when an if the relative preference for cash relative to other goods declines. I, like you, thing there is considerable reasons to be nervous. Having said that, as long as the demand for good and services remains depressed, we won't find out. Miami condo prices up 25% year-over-year. Now that is getting "interesting"! Have you bought any groceries lately? It's all a "Confidence Game" As long as we believe the 'Judas Goat' then everything will be fine. Sometimes 'Force Majore' intervene to upset the applecart. Of course the Fed is “printing money”. When the Fed buys bonds during OMO, it exchanges non-interest bearing debt for interest bearing debt. The non-interest bearing debt is created “out of thin air” with the Fed’s “magic checkbook” given by Congress. The non-interest bearing debt comprises the monetary base. The monetary base consists of cash and reserves. The Fed has no control over the amount of cash that is held. The cash then circulates doing its job as a medium of exchange. The reserve portion is that part of the monetary base upon which the pyramid of credit in the real economy is built. Of the reserve portion, required reserves are held out of the real economy by regulation. The fact that for the first time since the Great Depression, significant amounts of reserves are being held as excess reserves does not negate that these excess reserves are “printed money”. During the GD, excess reserves were maintained as a result of economic uncertainty. The Fed was on a gold standard so only that amount of monetary base demanded by the economy was supplied. Any excess monetary base supplied above demand would have returned to the Fed in exchange for gold. Since 1971 when Nixon severed the gold link and ended the international Bretton-Woods gold standard, the Fed is no longer constrained by anything “real”. Bernanke creates monetary base, “prints money”, without regard to demand. Why does the Fed need to create money out of thin air, which it then pays the PD banks IOER not to use? This is senseless in any rational economic world. Some 50% of excess reserves are being held by foreign bank subsidiaries. What Bernanke is doing is propping up, enabling, and quadrupling down on all the bad financial bets that should have been allowed to clear in 2008. This is based on Bernanke’s career making academic theory that the GD could have been prevented if the Fed had flooded the economy with liquidity, which was prevented by the gold standard. The theory is erroneous and in practice the results portend systemic economic collapse. Alan Reynolds made the point decades ago: "All inflations, everywhere, are preceded by a rise in the price of gold in that country's currency." Bernanke has presided over the POG rising from $350 to $1600 plus. Inflation is everywhere present, along with the requisite decline in standard of living, except in manipulated government statistics. I really enjoy reading your analyses and have found them to be very accurate in terms of foresight, but there is a major conceptual flaw that keeps recurring in one of your arguments. I'm referring to how you postulate that banks are content with holding reserves and how those reserves may be used to ramp up loans in the future, leading to increased inflation. Banks in aggregate cannot reduce their holding of reserves unless the public withdraws cash or the federal government reduces its holdings of deposits at the central bank (ie. move them to the private sector to buy goods & services). These actions are outside of banks' influence and in this regard, they have to accept whatever the fed gives them, and being content is not a factor. Secondly, the banks never loan out their reserves so there is no reserve constraint, and hence no risk of inflation no matter what the current reserve amount is now. All that matters from a loan perspective is whether a creditworthy customer walks into a bank, and the bank thinks it can extract a profit by loaning. Reserves don't constrain loaning ability, in fact the opposite, they are obtained after the loan is made, and the central bank will always oblige because it has to in order to target their overnight rate (which would go up if they wouldn't provide those reserves). That is one of the primary functions of the fed - it has to supply reserve currency to meet whatever demand is there from private banks in order to target the fed funds rate. It never uses the amount of reserves as a lending constraint and so the amount of reserves never is a concern to lending. There is a wonderful paper by Paul Sheard, Chief Global Economist at Standards & Poor titled "Repeat After Me: Banks Cannot and Do Not Lend Out Reserves" that explains it much clearer than I can here. Marcin: I think I've made it clear in my many posts on this subject that I do in fact understand the situation. Of course banks don't lend out reserves, but they do need reserves to make loans. Given the abundance of reserves today, banks effectively have no constraints on their ability to lend. Currently banks are holding a massive amount of excess reserves (reserves that are not needed to back up deposits) because they apparently have no desire to increase lending and/or the world has no desire to increase its bank borrowings. BTW, banks don't automatically get reserves from the Fed if they lend, but banks can automatically exchange their reserves for currency. If banks and the public change their attitudes, it is theoretically possible for there to be a gigantic increase in bank lending, and that would most likely result in a huge increase in inflation.